In order to avoid hopping on the antibiotics-go-round yet again, I decided to listen to the folks on the internet and give a humidifier a try. 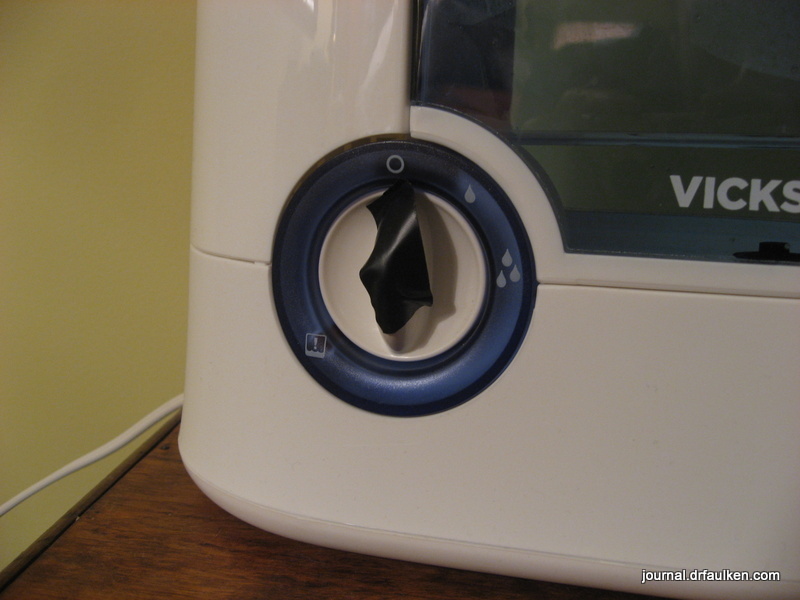 The Vick’s Warm Mist humidifier is a small room unit. It does not require a filter, nor does it have any of the extras that more expensive units offer, like UV light. It is also the highest rated unit on Amazon and fared very well in a Consumer Reports test of like humidifiers. The unit sits on a tabletop. Its base has rubberized feet to prevent slipping, and an easily removed reservoir tank for water. This reservoir has a built-in handle for carrying, and a large, easy to grasp cap on the other end which you remove to fill the unit with water. The base is simple and straightforward. There is one dial. When the unit is turned on this dial is back-lit (more on this later) . There are 3 icons around this dial. Starting at the top there is a circle which indicates power is on, moving to the right is 1 drop for low, then 3 drops for the highest setting. There is also an exclamation point much further on indicating a dry reservoir tank. Setting up the humidifier is simple. Place the base on the surface you have chosen (avoiding anything which could be harmed by water), detach the reservoir, fill with either filtered or distilled water. You can use regular tap water, however if you have water like ours you will cut down on maintenance and extend the life of your humidifier. Vicks includes “scent pad slot for the ability to be used w/ Vicks VapoPads or VapoSteam” which I have not tried. If I were terribly congested I can see the benefit, but for day to day use I don’t find it necessary. I like to run the humidifier at the highest setting. We have a fairly large bedroom so I also make sure to close all doors, including the closet and bathroom. Running it this way has resulted in the room’s humidity going from 35% to 50% overnight. It generates an interesting collection of sounds to get accustomed to. Lots of whooooshing and gurgling. The motor itself can be compared to a box fan on low. As with all humidifiers, there is a certain bit of maintenance which needs to be administered on a weekly basis. This includes wiping out the base where the tank sits to clear away any bacteria or viruses. Many people use vinegar as this will clear any mineral deposits which may have collected from your water. If you’re looking to try a humidifier to see if it makes a difference in your life, this is a fairly inexpensive way to test one for yourself. 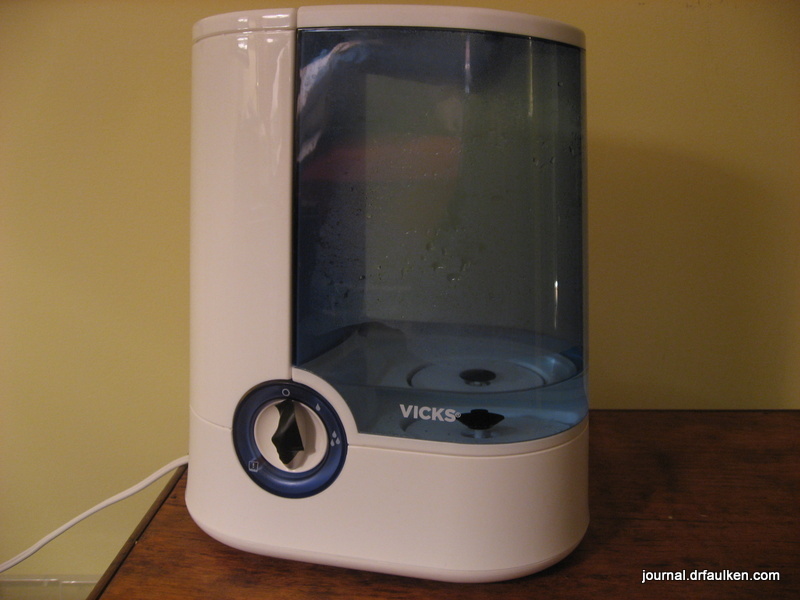 2 Comments on "Vicks Warm Mist Humidifier Review"
The middle of the night “Glug, Glug”, takes some getting used to. Thanks for the review; it’s a great reminder that I have options when my skin feels so dry all the time.